Red pen buzzing through and over her dream-laced stories, always. Are you sure about the use of ‘extra-ordinary’, here? (sp) exclaimed, exceptional. 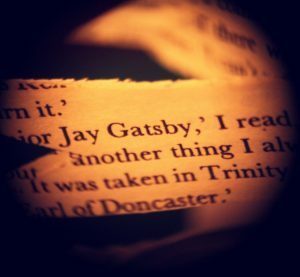 Later, when analyzing literature: Were you really enthused by ‘The Great Gatsby’? Re-read the ending; the text is enigmatic and poignant, not simply enthusing. Please see me. By college, she has learned to keep the excitement in, to crush it down underneath her ribcage like a secret present wrapped in crinkling brown paper. Sometimes when she moves, she hears it crunch, then panic-swallows it back into her stomach. This is a generic argument, Holly. Your opinion is missing. Amy J. Kirkwood writes MG/YA and flash fiction. Recent work appears in The Mechanics Institute Review: Volume 14 and InkTears 101. Her Twitter is @amyjkirkwood. Freshman year, my English Professor wrote, “See me” across the top of one of my composition. Freshman year, my English Professor wrote, “See me” across one of my composition. FYI – I did not!